We decided to gamble and have a friend of ours in a bigger boat haul our traps out for the opener, rather than having to do it over 4 days with the Harvester. We can only carry 80 or so traps at a time so this let us set all 300 to soak at once. 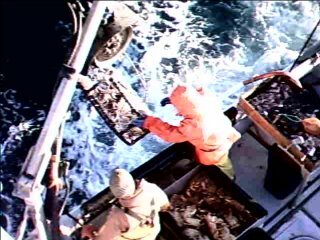 The weather was piss flat the crabs were active with the filling moon (Monday the 1st) full on the third and we had a good supply of fresh Humboldt squid and razor clams from Hallmark Fisheries that really brought in the numbers. We chop up the Humboldt squid in the two bags which are the nylon mesh bag) and then the razor clams in the jars for the scent. This opener we were getting about 40 crab per trap for the first pull of 300 traps which was pretty incredible, since we only had 15 to 20 crab last year. The first three trips we pulled 50,000 lbs , after that it started slowing down. 17.5k, 16.7k and then a 6k on one run. 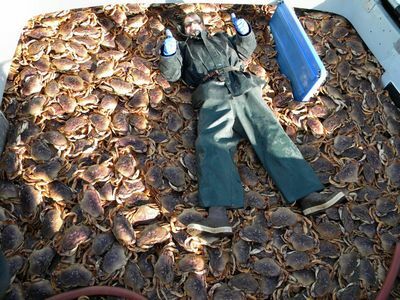 We can run 300 pots in ten hours, pulled 9 times over the last five trips for about 30,000 crabs at at little over 72,000 lbs. Without a doubt the best opening weeks we've ever seen. Why was the opener so great? One of the things about this season that was abnormal was the weather. 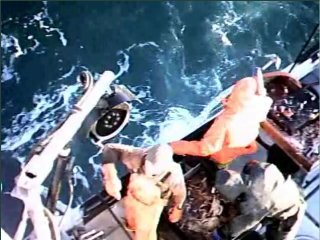 Most years the season starts with very rough weather giving a huge advantage to the big boats that can handle the big weather, forcing the little guys like us to risk short trips and run to shelter when things get bad. This year we were out in their face every day. We were spanking some of those larger boats and staying in their faces. It felt pretty good..
Another thing that helped was that so many crab were being caught all up and down the coast that no spot was getting over fished. Seemed like everywhere you went boats were scoring enough to stay where they were rather than plugging up the hot spots, so everybody had room to fish. We were able to compete and get more of a share of the volume because of the good weather I'm sure it mad the big boat owners grrr. Now that the full moon has gone away the crab are not as active so we give the traps a little more soak time on the bottom. If the crab are more active and in higher numbers you can pull traps more often, but when they are slower you have let them sit longer. Why does the full moon make the crab active? Nobody knows for sure, but it seems to be true. The trap pulls in any crabs in the area due to the scent of the bait and they have escape rings that are big enough for the juvenile crabs and the females are able to escape, but the ones we want (the big mature males) are stuck. The big ones also chase off the little ones so the longer you can leave the trap in an active area while the bait is still good the larger better crab you're likely have in your pot. Now we've had a good shot of rough weather with the recent store we're hoping it will stir up the bottom and bring the numbers back up. When these winter storms roll through they create big swells that disturb the mud where the crab bed down and will scatter any food that's on the bottom which usually gets them up and moving. We're going out on tomorrow at 4:00 – the traps have been soaking for 2 days on a spot we hope will be good. 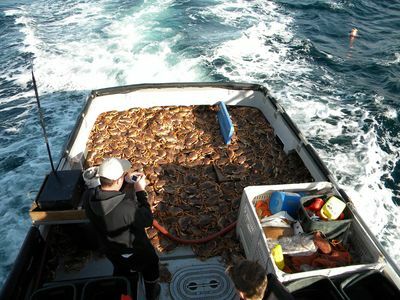 Now the crab tend to bunch up around good food sources so we have to move traps pretty often to stay on top of em. Going back out tomorrow we'll run the gear and areas that show good numbers are were we'll cork ourselves.. basically dump all the gear on the hot spots so the buoy's are nearly floating on top of each other. So it's been a heck of a start of the season and pretty much every boat on the Oregon Coast has been pulling great numbers. It's a nice thing for everybody so get down to your local market and get you some nice local Dungeness.